Is college worth it? With student debt reaching a staggering $1 trillion, it's a question that's been tossed around quite a bit in the past year. Ultimately, many would likely agree that yes, of course college is worth it, no matter the cost. After all, those with college degrees are the ones winning the higher-level jobs. Higher education rates and GDP are statistically linked; the more educated a nation, the more prosperous that nation is. A quick snapshot of mean income by varying levels of degrees - or lack thereof - makes it unequivocally clear: Historically, the more educated one is, the more money he or she can earn. So it's clear then, college is worth it, even if it can take decades to pay down debt from it. Right? That begs the question: What is the assumption behind that statement? The core assumption is that a college degree by definition guarantees a higher-level job after graduation. And what is the assumption behind that? That the economy is robust enough to support those jobs. Since the crash of 2008, there have been countless articles written about the devastating jobs picture for students graduating from college these days. The jobs just aren't there for them. Too many recent college graduates are being forced to take jobs traditionally filled by high school graduates. The once safe assumption that college guarantees a higher-level job is no longer safe because the once safe assumption that the economy would always support post-college employment is also no longer safe. Now consider President Obama's promise that by 2020, the United States will rank number one in global college education rankings (we currently rank 16th). To get to number one, 60% of Americans ages 25 - 34 would have to have college degrees; as of now, the rate for this age group is about 43.1%. The President's justification is that an educated workforce is a competitive workforce. But again, what is the assumption behind that? For any workforce to be competitive, it must have a critical mass of people employed in those industries that make us as a nation most competitive. Therefore, the assumption is that most of the competitive-industry jobs of tomorrow will require a college degree and that colleges will sufficiently prepare students accordingly. Can we know this will be true? A competitive workforce also cannot be saddled with debt. Justifying increased college graduation rates at a moment when tuition and student debt are skyrocketing assumes these trends will reverse. Will they? What happens if all, or even some, of these assumptions collapse? When the operating assumptions of any belief go bust, doesn't the belief at least have to get called into question? And is this all starting to look a little familiar? This assumption collapse framework looks disturbingly similar to that of the housing bust. At the crux of the housing boom was the belief that everyone deserved to own a home. Home ownership improved self-confidence, which improved families, neighborhoods and communities. Good on top of good on top of good. So Washington passed a series of laws to engineer homeownership. Wall Street exploited it. We know what came next. Oops, turns out, when we try to put people in homes who can't independently afford them, the economy collapses. Confidence collapses, neighborhoods collapse, communities collapse. Bad on top of bad on top of bad. All the assumptions behind full-scale homeownership went bust. For many, as it turns out, renting is the financially responsible decision. Watch this compelling video that parallels the housing bust to a possible higher education bust, and suggests that the assumptions we have long held about the value of college might no longer hold up in our current economy. If it is accurate that many people are financially better off renting rather than owning a home, could that by extension mean that for many, not going to college is the financially responsible decision? In the long run, might there be people whose personal finances would materially improve if they chose not to attend college? If our economy is in fact undergoing a paradigm shift, might how we view and value college also require a paradigm shift? Is college worth it? For some, probably. For some, maybe not. And should we as a nation be striving to send as many people to college as possible? Read on in our special section The United States of Student Debt for a snapshot of the state of college today. that nothing that is worth knowing can be taught." After Lehman went bankrupt and the world looked set to enter an economic death spiral, the governments all over the world launched a stimulus shock and awe campaign to save our economies. It worked, sort of. Our economies didn't collapse, but since then economies around the world, particularly Europe and the U.S., have required more and more stimulus. Within the last couple of weeks, both the U.S. and Europe have announced new stimulus programs, both of such a massive size that we may want to refer to them as Shock and Awe II. Interest rates are to be held down even longer than previously announced, and money printing will grow once again, hoping to stimulate our listing economies back into a growth mode. And why do we think this next round will succeed? The Fed actually left the duration of this next money printing exercise entirely open ended. If this new effort does not do the trick, will we just print money in perpetuity? Everyone seems either to wish for or be working toward recreating the economy of the late 1990s or the middle part of last decade. But are these hopes and efforts realistic? Technology continues to work its way through industry after industry, reducing the amount of labor needed per unit of output. And all the developed economies are in the midst of demographic shifts, with the number of older folks steadily increasing. Older folks don't spend as much money as yuppies. Old folks are not buying bigger and bigger houses, but smaller and smaller ones. The eldest generations of any society are, by nature, less economically stimulating. So it should be no surprise that the Federal Government continues to operate with a massive annual budget deficit and the Federal Reserve continues to print more and more money. When will this stimulus-driven economic phase end? Quite possibly not for a very long time, perhaps until maybe most of the Baby Boomers are dead. Until then, government will need to maintain a large social safety net and the Fed a very accommodative monetary policy. The good ole days are gone. These new days are entirely different. We all should expect to see this perpetual-pumping economy remain for a good while to come. The most recent unemployment data show more and more people dropping out of the employment market. (Our social safety net must be pretty darn good since people continue to defect from the labor market in droves.) Hiring has always mirrored economic vitality and vice versa. So why would there be any real reason to believe the economy is improving? Certainly the Fed's recent announcement reveals their fear that job creation and employment are stagnating. We'll just have to see how this new shock and awe changes things. In terms of our financial services market, it would appear that European financial institutions are going to have to keep contracting. European banks may have bit off way more than they can chew. It may be time to go back to the home country and save the family farm from burning down. If this happens, where will financial services job demand come from? Accommodative monetary policy by the Federal Reserve is actually very good for American banks, especially the ones that didn't get too big to fail. The too big to fail are still at great risk, with JPMorgan's recent trading fiasco showcasing how difficult it is to be master of the universe of everything. Where's the next growth market in financial services? Look to the super regional banks to start spreading their wings. They don't have the baggage of whatever it is that makes the super banks too big to fail. Dinosaurs eventually go extinct and new species emerge. That's the natural cycle of life. But don't expect 2007 compensation to return any time soon. That era is long gone. The future of banking has to be more financial service and less financial gambling. We are in control of some things, but we are never in control of everything. Sometimes our personal efforts produce great results, but sometimes circumstances are beyond our control. It's not just hard to stay in first place all the time because the effort required is monumental; it's also hard to stay in first place all the time because the world doesn't share our personal agenda. Accepting that life is inescapably a rollercoaster is the best way to manage our own expectations. If we're riding high on current success, a better perspective on the long-term big picture may keep us from making poor decisions. The world changes. The same holds true when the world seems to be raining down on us. The worm eventually does turn so long as we are persistent about creating good value. Consistently and persistently striving to create good value is the key to sustainability. The number of job openings in July was 3.7 million, little changed from June. The number of openings was little changed in all industries except health care and social assistance, where the number decreased. The number of openings was also little changed in all four regions in July. The level of total nonfarm job openings in July was up from 2.4 million at the end of the recession in June 2009. The number of job openings in July (not seasonally adjusted) increased over the year for total nonfarm, total private, and government. Job openings increased over the year for several industries but fell in mining and logging and arts, entertainment, and recreation. Three of the four regions - Midwest, Northeast, and South - experienced a rise in job openings over the year. The total separations rate, which includes quits, layoffs and discharges and other separations, was essentially unchanged for total nonfarm and total private, and unchanged for government in July. Over the year, the total separations rate was unchanged for total nonfarm, total private, and government. In July, the quits rate - generally voluntary separations initiated by the employee and can serve as a measure of workers' willingness or ability to leave jobs - was unchanged for total nonfarm, total private, and government. The number of quits was 2.2 million in July, up from 1.8 million at the end of the recession in June 2009. This chart reflects different education attainment rates of total U.S. population age twenty-five or older at a given moment. 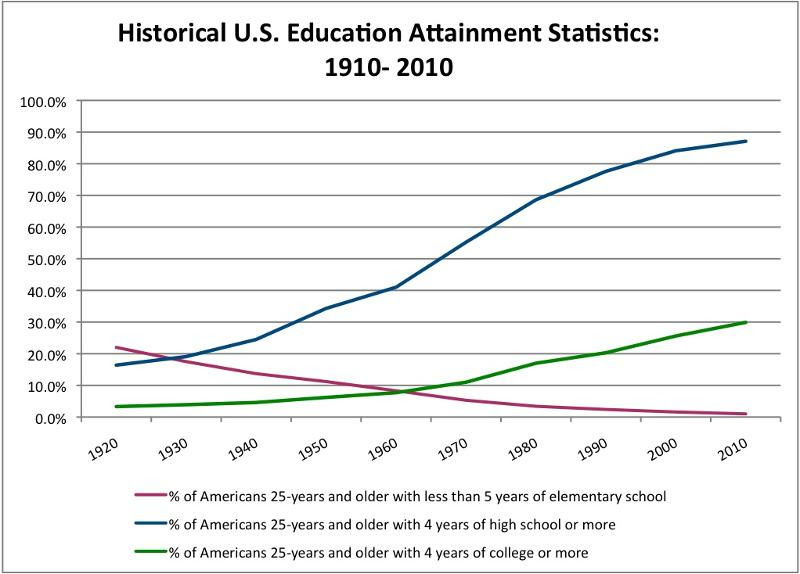 So in 1910, 23.8% of all Americans 25 or older had less than five years of elementary school, and 13.5% had four years of high school education or more. Only 2.7% of Americans 25 or older had a college degree or more in 1910. In 2010, the picture is dramatically different, with only 1% of Americans over the age of 25 having not reached an education attainment over five years of elementary school. As of 2010, 87.1% of Americans 25 or older had at least four years of high school, and 29.9% have at least four years of college or more. 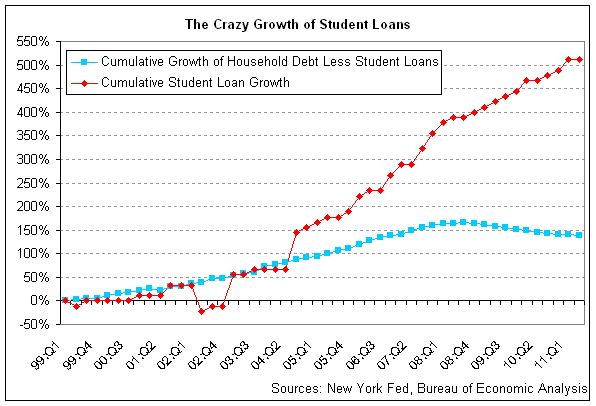 "The chart above is striking...See that blue line for all other debt but student loans? This wasn't just any average period in history for household debt. This period included the inflation of a housing bubble so gigantic that it caused the financial sector to collapse and led to the worst recession since the Great Depression. But that other debt growth? It's dwarfed by student loan growth." The Pew Research Center did a comprehensive study to understand Americans' general perceptions of college. 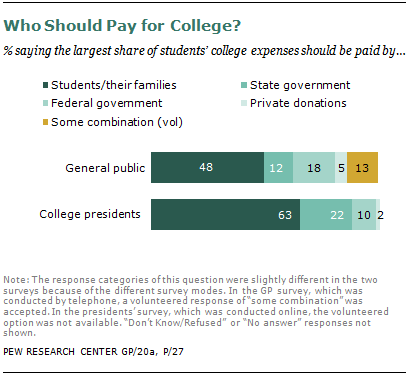 Fifty-seven percent of adults believe that college is not worth its cost, and 75% believe it is too expensive. However, 86% of those who graduated from college believe it was worthwhile. Pew also surveyed 1,055 presidents of two-year and four-year private, public and for-profit colleges and universities. Among other things, they were asked who should pay for tuition. Interestingly, the majority of presidents feel that individuals should foot most of the bill. Follow the link to view the full survey findings. The Heldrich Center for Workforce Development surveyed people who graduated from high school between the years of 2006 and 2011 and did not continue onto college. 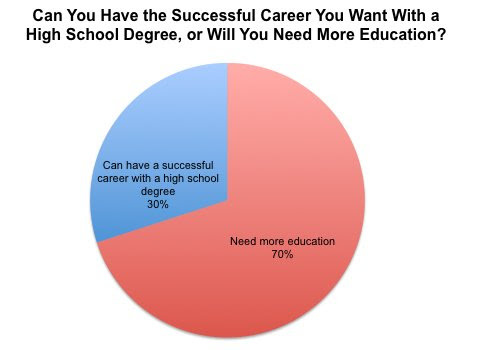 Overwhelmingly, this subset believes that a college degree is crucial to career success. However only 38% of this 70% plans to go to college; high tuition costs are prohibitive for many. How are Peter Thiel's college dropouts doing in the real world? Last fall, Silicon Valley tycoon Peter Thiel famously persuaded 24 college students to drop out of college and start a business. He enticed them with $100,000 each over a period of two years. His objective was to shake the assumption that college is a prerequisite to success. Thiel believes that truly talented young adults are better off bypassing the crushing debt of college and heading straight into enterprise. Nearly a year into Thiel's grand experiment, Business Insider checks in with some in the inaugural class to see how their entrepreneurial ventures are going. The U.S. college graduation rate - the proportion of all Americans twenty-five or older with a college degree - is predicted to fall from 29.9% in 2010 to 17.8% in 2020. Meanwhile, both China and India expect to see their college graduation rates rise, to 13.4% and 7.7% respectively. As a protracted trend, the U.S. could see itself lose its graduation rate advantage to China by 2030. What might be the larger ramifications? Long-term debt at our not-for-profit universities has been growing at 12% each year, a number that looks far more appropriate for a private company in growth mode. 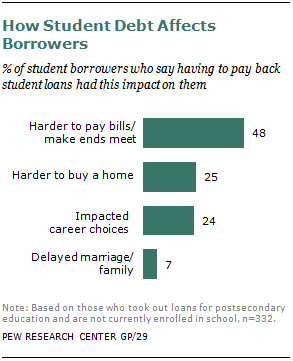 For what reasons are colleges going into debt? A new push to stay globally competitive has several schools opening up satellite campuses overseas. It also has them investing in all sorts of bells and whistles that are meant to impress. An example: "In the past two years the University of Chicago has built a spiffy new library (where the books are cleverly retrieved by robots), a new arts centre and a ten-storey hospital building. It has also opened a new campus in Beijing." The economy has caused many states to constrict funds for both public and private universities. To compensate, colleges are being forced to spike tuition; on average, it has risen three times the inflation rate since 1983. Yet the value of education is not rising with its cost, as little of the high cash outlays universities are making these days are put towards improving education quality. With so many universities spending as though they are for-profit companies, might many have to face restructuring akin to poorly managed private companies? And further to that analogy, if students are a university's shareholders, is spending money on library robots in the shareholders' best interests? Half of recent college grads are underemployed or jobless. Students with degrees in science, education and health fields are faring better. Those with majors in arts and humanities are struggling more in the work force. There is an argument, then, for encouraging college students to pick practical majors. It's been a common refrain that college majors are of little importance, but that appears to be a notion born from highly prosperous times, which at the moment, are in the rearview. Where then does the obligation fall to steer students towards practical majors that stand the greatest chance of generating a return on their investment? Career trends are always evolving and changing. However, the shifts can be rather dramatic and rapid amid recessions. This article lists the careers that appear to be rife with opportunity (computer programming remains in top demand), and those that appear to be nearing obsolescence due to recent economic, technological, social and business changes (don't bother trying to work for the USPS). A recent Brooking Institution study looked at decades of data on job listings and compares them with education levels in the U.S.'s 100 biggest labor markets. Results show that on average 43% of job postings require a bachelor's degree, yet only about 30% of adults over 25 hold one. Unemployment data speaks to this disconnect: Unemployment amongst those with only a high school diploma is 9.9%, while it is 3.9% amongst those with at least a college degree. While this doesn't totally answer the question of whether or not the labor force skills mismatch (which has apparently been an issue for decades) is the cause of persistent unemployment, might it suggest that college is necessary for a more stable career? than to have education without common sense." The Economist has built a global debt clock, which shows figures for almost all countries' federal debt in USD from 2001 to projections for 2013. 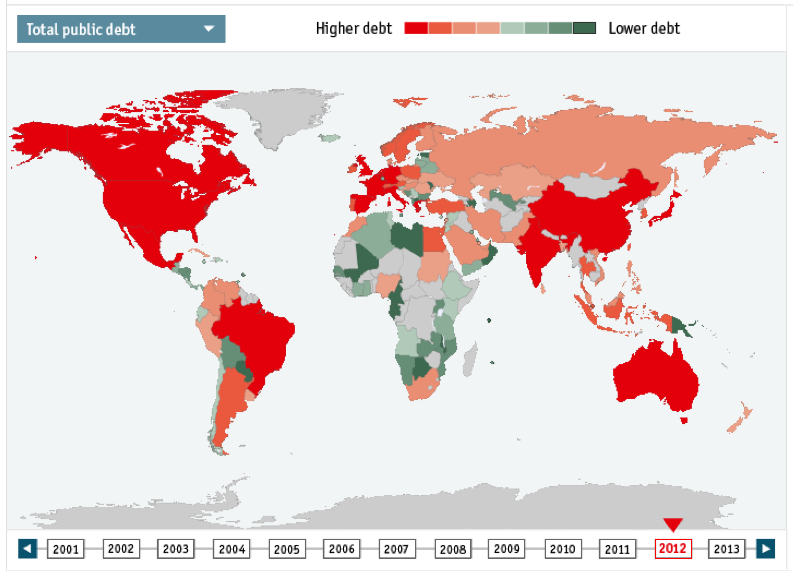 The interactive chart both tallies total global debt and reveals a world that appears to be bleeding money. Most Texans are well aware that the energy industry is booming. So far the economic benefits have been confined to states rich with natural gas and oil. While the long-term economic gains remain to be seen, there are indications that lower-cost natural gas is beginning to buoy other industries. Like steel, aluminum, cars, fertilizers and chemicals, where cheaper gas and power appear to be helping restore a competitive edge. Should gains from this materialize, America's manufacturing industries could see a much-needed boost. Cheaper energy might also allow consumers to keep more cash in their pockets, which could spur spending. And more oil produced domestically reduces our oil imports, which improves our balance of payments and reduces the amount of money that goes to nations sometimes hostile towards the U.S.
By definition, leaders should not micro manage, they should lead. But leaders often believe that micro managing is the only way to maintain control. Yet it often leaves them little time to lead, creating a problematic leadership vacuum. The best leaders facilitate a team's success, they don't micro manage it. This article puts forth four tactics leaders can apply to get out of their employees' way so that they can excel. One suggestion is to understand every team members' strengths and then allowing them to do what they do best. Trusting your team is also a powerful tool; it implicitly creates high expectations that people feel motivated to rise to meet. Read on for more compelling ideas to find the confidence to lead effectively. Emotions, and talk of them, have no place in the workplace, right? Wrong. An office is comprised of humans, which means an office is comprised of emotions as well. The best leaders will acknowledge the tremendous impact - both positive and negative - emotions can have in the workplace, and that they can spread, a term referred to as emotional contagion. Leaders hold a particularly strong influence on the mood and emotions of a workplace, and therefore they must be vigilant of the tenor they set. Tony Schwartz, CEO of the Energy Project, ranks any given employee's emotional tendencies as crucial as their cognitive skills. He explains the power of emotions in the workplace, and the responsibility leaders have to be mindful of their mood to avoid creating a toxic, demoralizing environment. Hotels.com CEO, David Roche, speaks to his goal of building a culture where weaknesses are tolerated. In his experience, he has come to understand that those with a tremendous strength often have weaknesses on the other side of it. To exploit the strength you're looking for, you must learn to tolerate weaknesses that come with talented employees. Quiz: What's your feedback style? Feedback - both giving and receiving - is crucial to successfully managed teams and companies. Yet few seem to be capable of giving it effectively and hearing it un-defensively. According to Dr. Joseph Weintraub, a management professor at Babson College, the key to productive feedback is knowing your feedback style and knowing how to adapt it the feedback style of your coworkers. Follow the link to discover your feedback style and what it means in terms of giving feedback to others.